CALGARY, ALBERTA–(Marketwire – March 4, 2013) – Strategic Oil & Gas Ltd. (“Strategic” or the “Company”) (TSX VENTURE:SOG) is pleased to announce that it has acquired the Cameron Hills and Bistcho assets (the “Acquired Assets”) of Paramount Resources Ltd. (“Paramount”), located adjacent to Strategic’s Steen River core area for total cash consideration of approximately $9 million (the “Acquisition”). In addition, Strategic has entered into a non-brokered private placement (see Private Placement herein) of $15 million at $1.25 per common share, of which Paramount will subscribe for approximately $9 million. Further, Jim Riddell, President and COO of Paramount Resources Ltd. and CEO of Trilogy Energy Corp., has agreed to join the Board of Directors of Strategic (see Addition of Board Member herein). The Acquired Assets will add approximately 500 BOE/d of production and 1.1 MMboe of reserves to Strategic on a highly accretive basis. Further, the Acquired Assets` associated plant and pipeline network are of significant strategic importance for accelerating the future growth from Steen River. The Acquisition represents a strategic expansion of the Company’s focus area and provides Strategic with abundant well control, seismic coverage, and significant light oil potential. The Acquired Assets represent approximately 500 boe/d (40% light oil) of production and over 200 net sections of land. 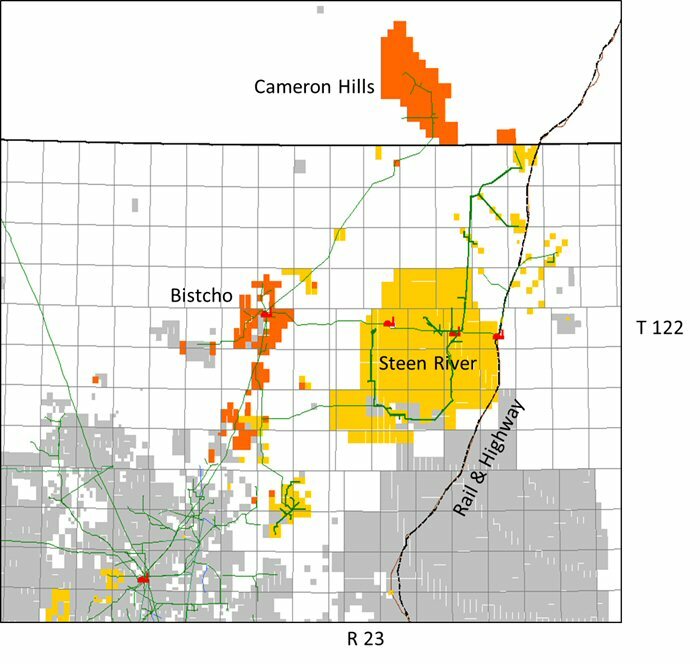 The Bistcho assets, located on the western edge of Strategic’s Steen River operations, have significant well control with opportunities for multi-zone subsurface upside. At Bistcho, there is a direct pipeline connection to the Rainbow Pipeline that will enable Strategic to reduce trucking charges while maintaining multiple accesses to market for its crude products. Cameron Hills is a high quality asset with significant oil and gas development potential. Access to a pipeline that will enable Strategic to connect Steen River oil production to the Rainbow Oil pipeline and eliminate oil trucking charges. Land base of over 200 net sections with light oil prospectivity in the Slave Point, Sulphur Point and Keg River. As shown in the map included in this news release, this expansion is highly strategic to the Company’s already large-scale position in northern Alberta. The Bitscho Assets are immediately adjacent to Strategic’s core Steen River land position and provide the next level of production handling capability through the Bistcho plant and pipeline and infrastructure. The Cameron Hills Assets provide a strong footprint in a proven oil and gas play with significant upside and build on Strategic’s ability to operate in northern locations. Strategic has entered into a non-brokered private placement (the “Private Placement”) of 12.0 million common shares at a price of $1.25 per common share for gross proceeds of $15 million, of which Paramount will subscribe for $9 million, subject to regulatory approval. Net proceeds of the Private Placement will be used in part to fund the Acquisition. Shares issued will be subject to a hold period expiring four months from the date of issue. Macquarie Capital Markets Canada Ltd. and Raymond James Ltd. acted as financial advisors to Strategic in connection with the Private Placement. This news release includes certain information, with management’s assessment of Strategic’s future plans and operations, and contains forward-looking statements which may include some or all of the following: (i) anticipated production rates; (ii) expected operating and service costs; (iii) expected capital spending; (iv) the Company’s financial strength and capitalization; (v) estimates of reserves; (vi) expected use of proceeds from the private placement; which are provided to allow investors to better understand the Company’s business. By their nature, forward-looking statements are subject to numerous risks and uncertainties; some of which are beyond Strategic’s control, including the impact of general economic conditions, industry conditions, volatility of commodity prices, currency fluctuations, imprecision of reserve estimates, environmental risks, changes in environmental tax and royalty legislation, competition from other industry participants, the lack of availability of qualified personnel or management, stock market volatility and ability to access sufficient capital from internal and external sources, and other risks and uncertainties described under the heading ‘Risk Factors’ and elsewhere in the Company’s Annual Information Form for the year ended December 31, 2011 and other documents filed with Canadian provincial securities authorities and are available to the public at www.sedar.com. Readers are cautioned that the assumptions used in the preparation of such information, although considered reasonable at the time of preparation, may prove to be imprecise and, as such, undue reliance should not be placed on forward-looking statements. The principal assumptions Strategic has made includes security of land interests; drilling cost stability; royalty rate stability; oil and gas prices to remain in their current range; finance and debt markets continuing to be receptive to financing the Company and industry standard rates of geologic and operational success. Strategic’s actual results, performance or achievement could differ materially from those expressed in, or implied by, these forward-looking statements or if any of them do so, what benefits that Strategic will derive there from. Strategic disclaims any intention or obligation to update or revise any forward-looking statements, whether as a result of new information, future events or otherwise, except as required by law. Gurpreet Sawhney, MBA, MSc., P.Eng.